In 2016, TRP began working with reigning world cup champion Aaron Gwin. The result is G-Spec, Aaron Gwin asked and we delivered every detail he asked for. 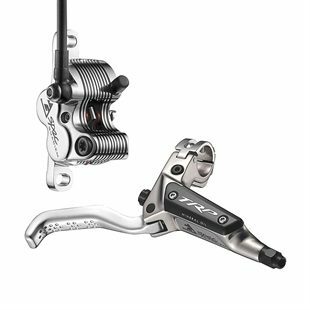 With no expense spared creating this brake, consumers can now stop with the world cup winning performance Aaron Gwin does. Designed in collaboration with World Cup Champion Aaron Gwin, the TRP G-Spec Quadiem brake raises the bar for downhill disc brakes. The TRP G-Spec Quadiem brake is made from forged aluminium that has been polished, CNC, then anodized to give the brakes an eye-catching finish. All G-Spec level brakes will feature new drilled lever blades designed by Aaron Gwin, hybrid pistons (composite/steel) for improved heat dissipation, and tool free reach adjust featuring detents to make fine tuning the lever reach easier than ever. More precise pad tolerances will significantly reduce unwanted pad play. Titanium hardware and CNC cooling fins add the final touch of quality to these top tier brakes.